The research is described in Science Robotics. It was led by a team of scientists from the Wyss Institute for Biologically Inspired Engineering at Harvard University and the Harvard John A. Paulson School of Engineering and Applied Sciences (SEAS). Designing a millimeter-sized robot that moves in and out of water has numerous challenges. First, water is 1,000 times denser than air, so the robot’s wing flapping speed will vary widely between the two mediums. If the flapping frequency is too low, the RoboBee can’t fly. If it’s too high, the wing will snap off in the water. Another major challenge the team had to address: at the millimeter scale, the water’s surface might as well be a brick wall. 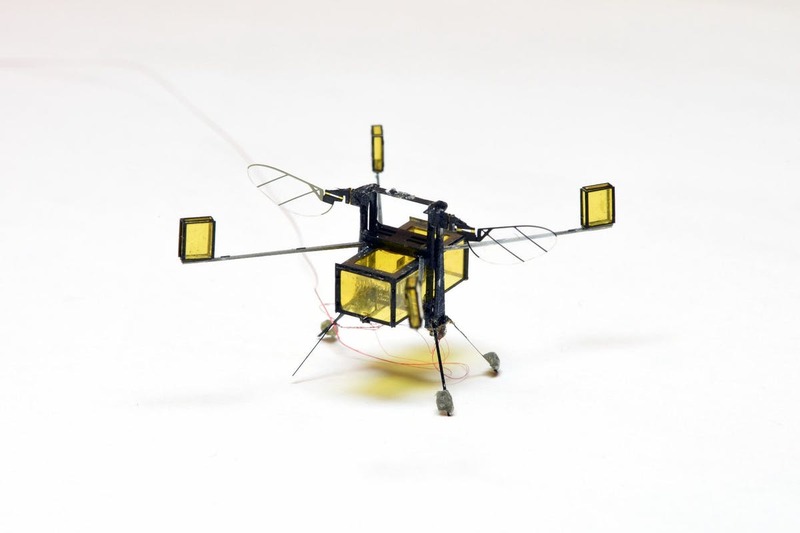 Surface tension is more than 10 times the weight of the RoboBee and three times its maximum lift. Previous research demonstrated how impact and sharp edges can break the surface tension of water to facilitate the RoboBee’s entry, but the question remained: How does it get back out again? The paper was co-authored by Hongqiang Wang, Ph.D., Postdoctoral Fellow at the Wyss Institute and SEAS; Noah Jafferis, Ph.D., Postdoctoral Fellow at the Wyss Institute; Raphael Zufferey, Postgraduate Researcher at Imperial College, London; Aaron Ong, Mechanical Engineer at the University of California, San Diego and former member of the Microrobotics Lab; Kevin Ma, Ph.D., Postdoctoral Fellow at the Wyss Institute; Nicholas Gravish, Ph.D., Assistant Professor at the University of California, San Diego and former member of the Microrobotics Lab; Pakpong Chirarattananon, Ph.D., Assistant Professor at the City University of Hong Kong and former member of the Microrobotics Lab; and Mirko Kovac, Ph.D., Senior Lecturer at Imperial College, London and former member of the Microrobotics Lab and Wyss Institute. It was supported by the National Science Foundation and the Wyss Institute for Biologically Inspired Engineering.